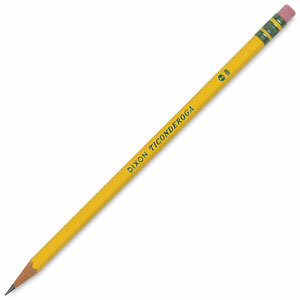 Ticonderoga pencils are "The world's best pencil." Every Ticonderoga pencil features a satin-smooth finish that enhances writing comfort. The exclusive graphite core offers an extra-smooth writing experience, and the top-quality, latex-free eraser provides easy, clean corrections. Every pencil in this set is crafted from premium, PEFC-certified wood. 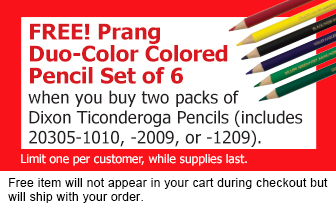 Box of 12 — These yellow hexagon-shaped pencils feature a smooth-writing #2 graphite core, a premium pink eraser, and Microban antimicrobial protection. Available sharpened and unsharpened. 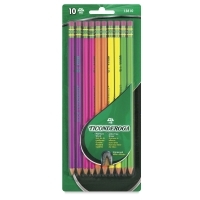 Neon Pencils, Set of 10 — This set of 10 No. 2 pencils in bright neon colors includes two each of Purple, Pink, Orange, Yellow, and Green. 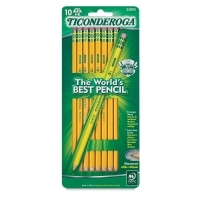 Every Ticonderoga pencil features a satin-smooth finish that enhances writing comfort. The exclusive graphite core offers an extra-smooth writing experience, and the top-quality, latex-free eraser provides easy, clean corrections. Every pencil in this set is crafted from premium, PEFC-certified wood.